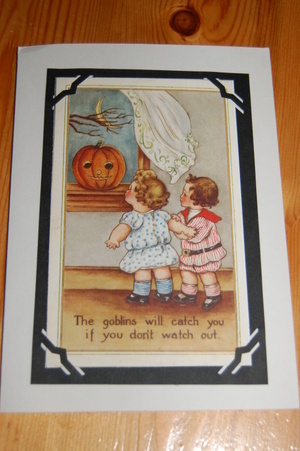 Every year I get a Halloween postcard from Pam, a very good friend in USA. She is an avid vintage postcard collector, and make reproductions of cards from her collection. Last year I made a page in my scrap books using the card I got from Pam, this year her card will stand in the windowsill together with two other Halloween postcards, also from friends in USA. Halloween is no traditional celebration in Norway, which means that we never think of sending cards. This make it an even more special treat to recieve cards. So thank you Pam, Cynthia and Darla, I love your Halloween cards. where shutters banged and clattered. while leaves and branches scattered. and made the cat's fur rise. The celebration is slowly growing in Norway though. A year ago Marta invited her friends to a Halloween party. We had started planning another party this year, but then she got a birthday invitation instead. 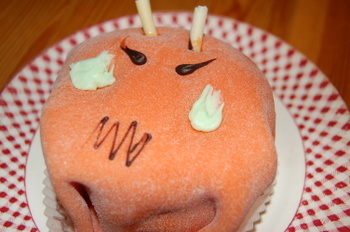 And she, I and har daddy had a little early celebration last night with a spoky creampuff for afternoon coffee.